This week it was my turn to supply the sketch and the challenge for this round. I have been under the weather for a few weeks now with a bad back and now sinus infection :( Please check out Kris and Vicky's blogs for inspiration and also to see what they have done for this challenge. Please play along with us at Sunny Challenges and Creations and who knows you may just be our next Ray of Sunshine! ﻿The challenge this week is really very simple, all you had to do was to follow the sketch there were no added stipulations this week, so go for your life and have a bit of fun with the challenge and dont forget to share it with us! My card base was Very Vanilla which I matted using a piece of Cherry Cobbler and run through the Big Shot using the Houndstooth embossing folder. I topped that with a piece of Vanilla satin ribbon across the card and then layerd a piece of Pear Pizazz which had been embossed using the Square Lattice embossing folder. 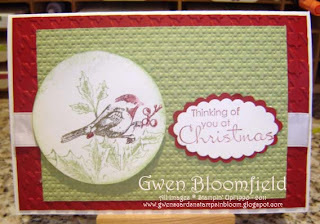 The image was also stamped onto Very Vanilla Cardstock, I coloured the images with my blender pens, the sentiment I stamped using Cherry Cobbler ink and then punched it out using the scallop oval punch, then running the scallop oval from the movers and shapers Punch Windows. I think it made a very pretty Christmas card and on the inside I added a Scallop Trim Border in Cherry Cobbler along with the verse from the set Beautiful Season. I like your take on the sketch Gwen. The colours go so well together & the way you have coloured your image - perfect!!!! Gwen, I love your card. It is so pretty, especially the bird.